How to Synchronize the Clock Strike Mechanism? If your clock does not strike the correct number of times as indicated by the hour hand then use this procedure to correct it. Before attempting to synchronize the strike mechanism, make sure the clock is wound (see instructions above). Turn the minute hand clockwise to “6” and if “12” is passed, stop and let the clock strike. At “6”, stop and let the clock strike; if it does not strike one time, then move the minute hand pass “12” without stopping, and then stop at “6”. The clock should now strike once at “6”. Now turn the hand to “12” and stop. Count the number of strikes and then carefully move the smaller or hour hand (grasp the smaller hand near the center arbor when turning) to that number on the dial. (Example, if the clock strikes five, move the hour hand to “5” on the dial). Your clock is now synchronized. Now the clock needs to be set to the correct time; turn the minute hand clockwise around the dial letting the clock strike at “6” and “12” until the correct time is reached. We have a wall clock with a pendulum and Westminster Chimes. It was in our basement for a long time, and not running. We brought it up and started it back up (battery operated). It chimed about 6 hours off, so we did try to fix this ourselves. Now it chimes out the right hour, but at the half hour (6) instead of at the 12. How can we correct this? Unfasten the small nut at the centre of the hands and gently pull off the minute hand. if the hand was pointing to five at this point, put it back on the shaft, pointing at eleven (five minutes to the hour, normally there is a square ‘hole’ in the hand that corresponds with the shape of the shaft, so long as you don’t try to force the hand onto the shaft, you will do no damage. Then replace the holding nut. Restart the clock and in five minutes, the clock will strike the hour as it should. THE HERTZ GRANDFATHERS CLOCK CHIMES ON THE HOUR BUT THE QUARTER HOUR CHIMES ARE OFF. HOW DO YOU RESET THEM? But what does one do when the clock strikes the synchronized hour OK for a few days and then slips off the synchronization usually striking the hour ahead of where it should be, e.g. striking 10 bells for 9:00 o’clock.? It’s an old mantle clock that was among my dad’s clock collection of mostly lantern clocks. But he died many years ago, and a local clock repairer has not fixed the problem. Guess I’ll have to have a go at it myself. Any suggestions? Remove the hour hand you will see that the square hole that fits the shaft is set in a collet. Place a squared off piece of metal in the hole and VERY GENTLY move the hand a little so that the collet slips round clockwise to advance the hand anticlockwise to retard. I have an old nail that I ground down for this purpose. Don’t force it and apply the pressure as close to the collet as possible. My clock does not chime on the quarter hour, but it strikes correctly on the hour. How can I correct that? Thank you soooo much. This was by far the BEST instructions for getting our Gustav Becker wall clock back to the correct hour. I’ve printed this off and hidden it behind the clock in case this ever happens again. Again, a big huge thank you! How does one synchronize the striking train? I the clock is completely disassemble for cleaning then the gathering pallet must be in a certain relationship to the locking wheel and detent. What is the relationship? My grandfather clock only strikes once on every hour. Do you know how this can be corrected? Thank you for your excellent instructions…easy to follow and worked perfectly to correct the problem. 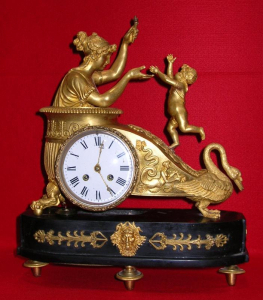 Copyright © 2019 Clocks of Yore - Specializing in European Clock Restoration.